Whew, what a day. Wednesdays are always hectic for me now that the Ten Holiday projects are going out weekly. I have been making orders, designing projects, shipping orders, etc. Because of this, I don't get to my blogging as much as I would like too. But I made it here today to blog. Above is a Holiday necklace to get you in the mood. I have some other pieces I would liked to have photographed but darn it, it's raining. It's great it's raining since we haven't had a good amount since August, but it throws me off. I take all of my photos outside for the bright sunlight. I did manage to get a few things up on Etsy today but I am not happy with my rainy day photographs so tomorrow, if it's not raining I will re shoot them. 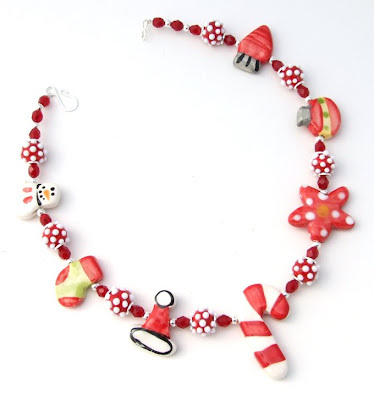 This necklace is jammed packed with holiday beads. You might notice there are some new designs in there. I have added poinsettias, candy canes, Santa hats, and more to the website for the season.